We are Manufacturer, Exporter and Supplier of Stomach Tubes. They are specially designed to allow nasogastric introduction of nutrition. The Stomach Tubes can also be used for aspiration of intestinal secretion. 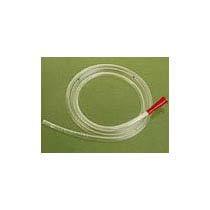 We make available the Stomach Tubes in different length and colors. Tube : Radio opaque, soft, kink free non toxic PVC tube. Two / four lateral eyes for aspiration & administration. Marking : 40,50,60 / 50, 60 & 70 c.m. from the tip for accurate placement.